Whether you’re building marketing analytics, a portal for e-commerce sites, or an application to cater to schools, if you’re building an application and your customer is another business then a multi-tenant approach is the norm. The same code runs for all customers, but each customer sees their own private data set, except in some cases of holistic internal reporting. Early in your application’s life customer data has a simple structure which evolves organically. Typically all information relates to a central customer/user/tenant table. With a smaller amount of data (10’s of GB) it’s easy to scale the application by throwing more hardware at it, but what happens when you’ve had enough success and data that you have no longer fits in memory on a single box, or you need more concurrency? You scale out, often painfully. This scale out model has worked well for the likes of Google and Instagram, but also doesn’t have to be as complicated as you might think. 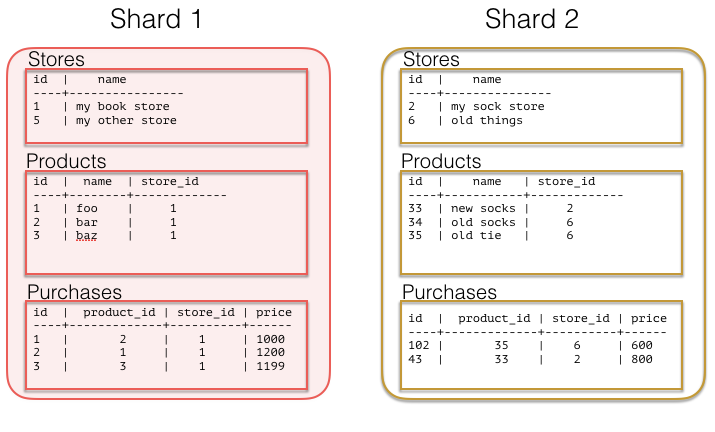 If you’re able to model your multi-tenant data in the right way sharding can become much simpler and still give you the power you need from a database including joins, indexing, and more. While Citus lets you scale out your processing power and memory, how you model your data may determine the ease and flexibility you get from the system. If you’re building a multi-tenant SaaS application hopefully the following example highlights how you can plan early for scaling without having to contort too much of your application. From here you could envision how to give each store its own presence and analytics. Now if we fast-forward a bit and start to look at scaling this out then we have a choice to make on how we’ll shard the data. The easiest level to do this at is the tenant level or in this case on store id. With the above data model the largest tables over time are likely to be products and purchases, we could shard on both of these. Though if we choose products or purchases the difficulty lies in the fact that we may want to do queries that focus on some high level item such as store. If we choose store id then all data for a particular store would exist on the same node, this would allow you push down all computations directly to the a single node. Co-locating data within the same physical instance avoids sending data over the network during joins. This can result in much faster operations. With Citus there are a number of ways to move your data around so you can join and query it in a flexible manner, but for this class of multi-tenant SaaS apps it’s simple if you can ensure data ends up on the shard. To do this though we need to push down our store id to all of our tables. The alternative to colocation is to choose some lower level shard key such as orders or products. This has a trade-off of making joins and querying more difficult because you have to send more data over the network and make sure things work in a distributed way. This lower level key can be useful for consumer focused datasets, if your analytics are always against the entire data set as is often the case in metrics-focused use cases. It’s important to note that different distribution models can have different benefits and trade-offs. In some cases modeling on a lower level entity id such as products or purchases can be the right choice. You gain more parallelism for analytics and trade off simplicity in querying a single store. Either choice of picking a multi-tenant data model or adopt a more distributed document model can be made to scale, but each comes with its own trade-offs. If you have the need today to scale out your multi-tenant app then give Citus Cloud a try or if you have any questions on which might work best for your situation please don’t hesitate to reach out to us. We can help.